Design your own EMR Detection Kit by combining any of our RF Meters, EMF Meters, or EMF/RF Detectors. 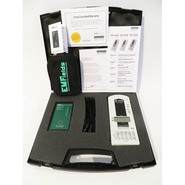 This kit entitles you to a 5% discount on your purchase and includes a complimentary carrying case for your meters. Just add any 2 EMF or RF meters to the shopping cart. The disount and carrying case will be added during the checkout process.